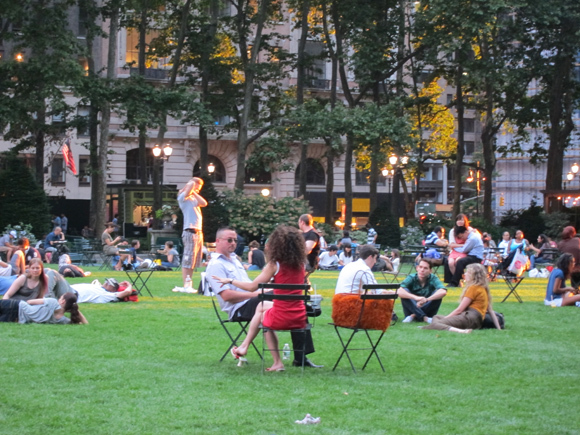 @LvndrHppE: "I'd have to say, of all the parks in NY, @BryantParkNYC is my absolute favorite." @aubreyliciouss: "Laid out in @BryantParkNYC! I love it here <3"
Love for the park has been abundant on Twitter, since this little bit of Indian Summer descended upon New York City over the weekend. We're pleased that the weather has finally decided to cooperate, so all can enjoy the final days of the lawn, which will close in just a few weeks. In order to open Citi Pond and The Holiday Shops on time, the last day of the lawn will be October 10 most likely be October 14 ***, with Pond and Shop installation beginning immediately ever. ***Update as of September 28: The lawn will close earlier than originally expected to allow for grading, trenching and irrigation line winterizing.